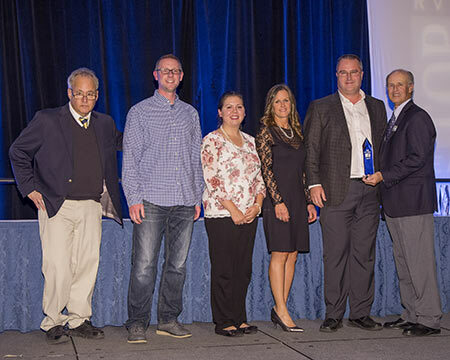 Bath, Churchville, Victor and Cicero, NY – With a standing-room only crowd overflowing out of the Champagne Ballroom at the Paris Las Vegas, the RVBusiness magazine 2018 Top 50 Dealers Awards reception honored North American RV dealers on Wed., Nov. 7, during the annual RV Dealers Association International Convention/Expo for their outstanding customer service, community involvement and general excellence in overall operations. Among the RVB Top 50 was local dealer [your name], who also received special distinction as one of five Blue Ribbon honorees singled out for their exemplary performances. The process for determining the 2018 RVBusiness Top 50 Awards was an involved one, beginning with harvesting qualified nominees in early summer. RV manufacturers were asked to put forth dealer partners based not on sales volume but whom they felt exemplify RVB Top 50 qualities and practices. Those dealers were invited to complete the program’s extensive application. Then, an expanded 11-person panel of independent industry insiders met in an intensive two-day, closed-door session in early September to review all the applications and complete their selections. 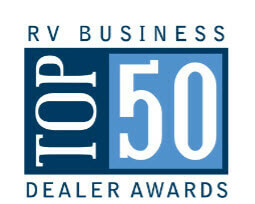 “We were able to field a judging panel that had expanded familiarity and experience with customer service operations at RV dealerships across North America,” reported BJ Thompson of marketing firm BJ Thompson Associates, which has helped organize the RVB Top 50 program since its founding in 2008. RVBusiness Publisher Sherm Goldenberg said the RVB Top 50 award continues to gain momentum and value among North American dealers, contributing to the program’s mission to elevate the industry as a whole. 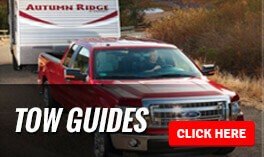 For more information about Wilkins Recreational Vehicles, visit wilkinsrv.com or call 800-724-2105. Bath, Churchville, Victor and Cicero, NY – RVBusiness magazine recently named local dealership Wilkins RV, with locations in Bath, Churchville, Victor and Cicero, New York, as one of its 2017 Top 50 RV Dealers in North America. “We are honored and humbled to again be chosen as one of the top dealers in the country,” stated Brian Wilkins, president of Wilkins RV. RVBusiness asked recreation vehicle manufacturers to nominate dealers across the United States and Canada who exemplify best practices and excellence in their field. Nominees were invited to fill out comprehensive applications describing business aspects including customer service and satisfaction, employee training, financial planning, marketing and community involvement. An independent panel of industry experts convened at the RV/MH Hall of Fame in Elkhart, Ind., the unofficial “RV Capital of the World,” to select the RVB Top 50 from nominated dealers who submitted applications. Program coordinators expanded the judges’ panel this year, bringing perspectives from even more areas of RV-industry business specialization. The extra hands also helped make lighter work of the extensive applications received, according to Sherman Goldenberg, publisher of RVBusiness magazine and founder of the Top 50 program. The 2017 class of RVBusiness Top 50 dealers were honored at a Nov. 8 awards reception in front of an all-industry standing room only audience of over 400 during the 2017 RV Dealers Association (RVDA) International Convention/Expo at Bally’s Las Vegas, presented in cooperation with the RVDA of both the United States and Canada and underwritten by the program’s sponsors: Airxcel, Ally Financial Inc., Cummins Power Generation, Dometic Corp., Freightliner Custom Chassis Corp., Lippert Components Inc., NTP-STAG, Protective Asset Protection, Truma and Wells Fargo CDF. Fairfax, VA – The Recreation Vehicle Service Technician Certification Board is pleased to announce that Lex Stevens of Wilkins RV has successfully recertified as a Certified RV Technician. The industry certification lets consumers know that the service technician working on their RV has developed well-rounded RV repair, diagnostic, and component part replacement skills. Certified technicians must renew their credentials every five years. They are required to participate in 20 hours of industry sponsored training and have continuous employment in the industry. To gain certification each technician must complete The Career Ladder-- a rigorous two-step testing process. Certification standards were developed by a team of RV industry technical experts under the supervision of educational testing professionals from the Michigan-based National Occupational Competency Testing Institute (NOCTI). Established in 1993, the RV service technician certification program is administered by Recreation Vehicle Dealers Association (RVDA) and Recreation Vehicle Industry Association (RVIA) under the auspices of the RV Service Technician Certification Governing Board. The program tests, certifies, and recertifies RV service technicians in either a traditional certification or five specialty certification areas: Appliance, Body, Chassis, Electrical Systems and Plumbing. For more information, go to www.rvtechnician.com. Fairfax, VA – The Recreation Vehicle Service Technician Certification Board is pleased to announce that Kevin Didas of Wilkins RV has successfully recertified as a Certified RV Technician. The industry certification lets consumers know that the service technician working on their RV has developed well- rounded RV repair, diagnostic, and component part replacement skills. NY – Wilkins Recreational Vehicles, Inc announced that it has completed the purchase of the former Ballantyne RV and will soon be opening operations at its two former locations, located in Victor, NY and Cicero, NY. “We are proud and excited to take over and build upon the proud heritage that has been built by Ballantyne RV and its employees over the past 40-50 years. We know they have a great customer following and we look forward to earning their business and provide them the service and support they need”, stated Brian Wilkins, President of Wilkins RV. “From a strategic standpoint, this move allows us to better serve the eastern side of the Rochester market and provides us an entry into the Syracuse market,” stated Wilkins. Both locations are pending license approval from NY State with opening planned as soon as that is obtained. “Applications were submitted approximately 4-5 weeks ago, and we are prepared to open as soon as New York State gives us the green light,” stated Wilkins. Wilkins RV was founded by Charles Wilkins in 1936 in Hornell, NY as an auto detail shop. Charles and his son Ronald started selling RV’s in the fifties and Ron ran the business until selling it to his son, and current owner, Brian in 2004. Wilkins RV moved from Hornell to a 50,000 square foot dealership in Bath, NY in 2006 and expanded to its second location, in Churchville, NY, in 2011. Churchville, NY – February 7th, 2017 – Wilkins RV of Churchville, NY has been awarded a 2017 DealerRater Dealer of the Year Award, which recognizes auto and RV dealerships across the U.S. and Canada who deliver outstanding customer service, based on consumer reviews written on DealerRater.com. The DealerRater Dealer of the Year Awards are based on reviews by new- and used-car and RV shoppers and those who took their vehicles and RV's into dealerships for service. Reviewers evaluated Wilkins RV of Churchville on its customer service, quality of work, friendliness, pricing and overall experience. Wilkins RV of Churchville has demonstrated consistently high PowerScore™ ratings for customer satisfaction, placing it in the top of its class. The PowerScore is determined using a Bayesian algorithm that factors the dealership’s average DealerRater consumer rating and the total number of reviews written about the dealership during the 2016 calendar year. "We are certainly honored to receive this award. We strive to provide our customers with World Class customer service every day. We take our reputation seriously, and this award is a testament to such,” stated Brian Wilkins, President of Wilkins RV. “Today’s car and RV shoppers pay attention to reviews and a dealership’s online reputation, which makes the significance of the DealerRater Dealer of the Year Awards crucial to dealers looking to thrive in today’s business environment,” added Tucker. DealerRater has an audience reach of more than 40 million consumers who read more than 3 million dealer reviews. About DealerRater: Founded in 2002, DealerRater, a Cars.com Company, is the world’s leading car and RV dealer review website that connects consumers with the right person at the right dealership. The site offers more than 2.5 million sales and service reviews across 41,000 U.S. and Canadian dealerships, including a network of more than 5,600 Certified Dealers. More than 14 million consumers read DealerRater content across the web each month. By offering a product suite that allows qualified dealerships to manage their reputations and achieve higher SEO rankings, DealerRater supports new customer connections by growing online presence. We are excited to announce that Paul Genovese of Forest River RV has been selected by our sales team as the winner of our Manufacturers Sales Rep of the Year Award for 2016. Paul is our sales rep for the Sun Seeker motorhomes and has been since we took the line on in 2010. Paul was cited for his product knowledge, always being available to assist a sales person when needed, being very active with retail customers and for doing a great job with product training on a product that has been very important to our dealerships success. At the recent RVIA trade show, Paul was presented with an award honoring his achievement and a $150 gift certificate at a local restaurant. We want to say THANK YOU to Paul for his extra effort. We can all certainly agree that having a strong sales rep goes a long ways in helping us to successfully represent a manufacturer’s product. Bath and Churchville, New York – RVBusiness magazine recently named local dealership Wilkins RV, located in Bath and Churchville, NY, as one of its 2016 Top 50 RV Dealers in North America. “We are so proud to have again, been included with such a great group of RV dealerships across the country. It’s a tribute to the nearly one-hundred employees between our two locations who work so hard every day to be the best RV dealership for our customers. It’s also a tribute to all of our loyal customers who continue to support us year after year,” stated Wilkins RV President, Brian Wilkins. 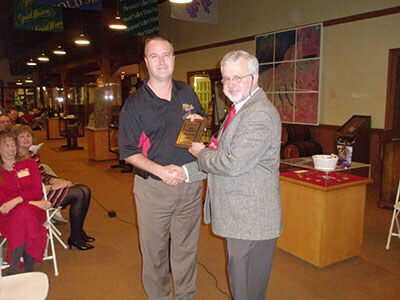 Wilkins RV has received the honor the past three years and four of the past six years. Program coordinators expanded the judges’ panel this year, bringing perspectives from even more areas of RV-industry business specialization. The extra hands also helped make lighter work of the applications received, which were in greater number and detail than any previous year, according to Sherman Goldenberg, publisher of RVBusiness magazine and founder of the Top 50 program. The 2016 class of RVBusiness Top 50 dealers were honored at a Nov. 9 awards reception in front of an all-industry audience of about 400 during the 2016 RV Dealers Association (RVDA) International Convention/Expo at Bally’s Las Vegas, presented in cooperation with the RVDA of both the United States and Canada and underwritten by the program’s sponsors: Ally Financial Inc., Cummins Power Generation, Dicor Corp., Dometic Corp., Freightliner Custom Chassis Corp., Lippert Components Inc., NTP-STAG, Protective Asset Protection and Wells Fargo CDF. Congratulations to Neal and Mindy, Caden and Lexie Brown from Elmira, NY. Winners of the $1,000 Cash Giveaway at our Customer Appreciation Event – Bath Location. Manufacturers Sales Rep of the Year Award for 2015. Wilkins RV proudly announced recently that Rob Schwindaman, of Heartland RV has been selected by their sales team as the winner of their Manufacturers Sales Rep of the Year Award for 2015. Rob is a sales rep for the Big Horn & Oakmont product lines and has worked with Wilkins RV since 2013. Rob was cited for his product knowledge, always being available to assist a sales person when needed and for doing a great job with product training on a product that has been very important to their dealerships success. This past Thursday, at Wilkins RV’s Bath location, Rob was presented with an award honoring his achievement and a $150 gift certificate at a local restaurant. Bath and Churchville, New York – RVBusiness magazine recently named local dealership Wilkins RV, located at Bath and Churchville, NY , as one of its 2015 Top 50 RV Dealers in North America. 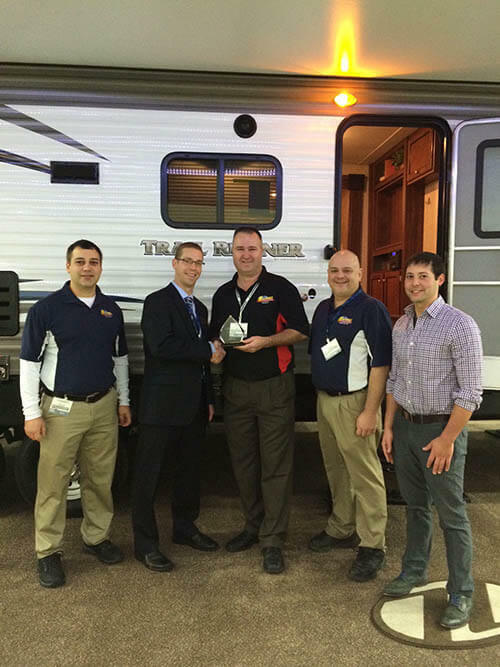 “It’s an honor to be included with such a great group of RV dealerships across the country. It’s a tribute to the eighty-five plus employees between our two locations who work so hard every day to be the best RV dealership for our customers. It’s also a tribute to all of our loyal customers who continue to support us year after year,” stated Wilkins RV President, Brian Wilkins. Wilkins RV has received the honor the past two years and three of the past six years. RVBusiness asked recreation vehicle manufacturers to nominate dealers across the United States and Canada who exemplify best practices and excellence in their field. Nominees were invited to fill out comprehensive applications describing business aspects such as customer service and satisfaction, employee training and education, financial planning and property management. An independent panel of veteran industry experts convened for judging the applications at the RV/MH Hall of Fame in Elkhart, Ind., the unofficial “RV Capital of the World,” to select the RVB Top 50. 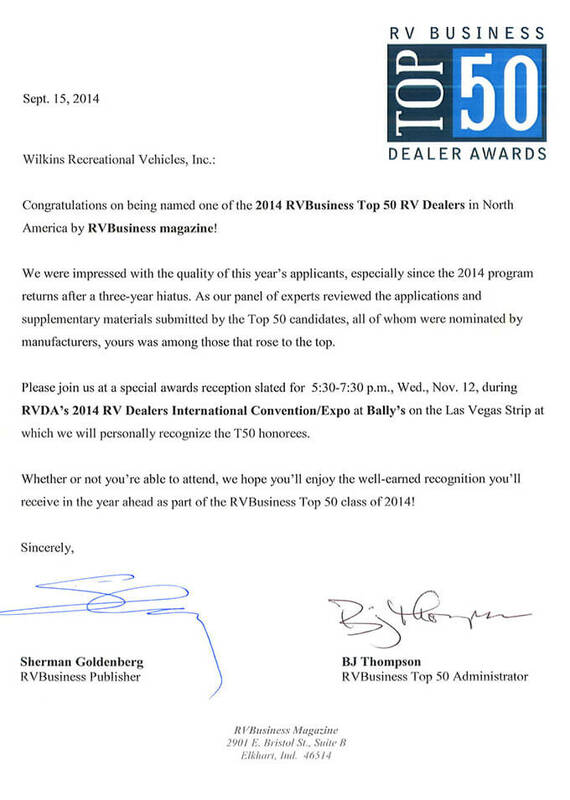 The RVBusiness Top 50 dealers were honored at a Nov. 4 awards reception in front of an all-industry audience of about 400 during the 2015 RV Dealers Association (RVDA) International Convention/Expo at Bally’s Las Vegas, presented in cooperation with the RVDA of both the United States and Canada and underwritten by the program’s sponsors: Ally Financial Inc., Cummins Power Generation, Dicor Corp., Dometic Corp., Freightliner Custom Chassis Corp., GE Capital Commercial Distribution Finance (CDF), Lippert Components Inc. and Protective Asset Protection. “RV Business puts on a great industry event in honoring the Top 50 dealers. It is certainly a great reward to be recognized in front of our peers,” stated Wilkins. Fairfax, VA – The Recreation Vehicle Service Technician Certification Board is pleased to announce that Mark Guinup of Wilkins RV has successfully recertified as a (Certified or Master Certified) RV Technician. The industry certification lets consumers know that the service technician working on their RV has developed well-rounded RV repair, diagnostic, and component part replacement skills. Appliance, Body, Chassis, Electrical Systems and Plumbing. For more information, go to www.rvtechnician.com. Wilkins Family Charitable Foundation hosts Fifth Annual Golf Tournament to benefit Alzheimer's Disease Research. Bath, New York: The Wilkins Family Charitable Foundation (WFCF) held its Fifth Annual Charity Golf Tournament at the Bath Country Club in Bath, New York on August 6th. The annual event was created in 2011 with proceeds benefiting Alzheimer's Disease Research. One-hundred forty golfers and over one-hundred sponsors and donors showed support of the event helping to raise approximately $54,000 and bringing its five year total to over $180,000. "In 2013, we partnered with the University of Rochester's Medical Center to create the Patricia Wilkins Alzheimer's Research Fund", stated Brian Wilkins, who along with his father and two brothers created the Wilkins Family Charitable Foundation to help his mother, Patricia Wilkins, raise awareness and funds to help fight the disease she became victim to in 2007, and eventually lost her life to in 2013. "Through this fund, we have pledged $150,000 over three years to support Alzheimer related programs within their Neurology department. The URMC has a great program and a dedicated staff that is driven to find a cure for this disease, and we are proud to be working with them. The proceeds for this year’s tournament will go towards helping to fulfill this pledge." Major sponsors for the event included Bank of the West, Heartland RV LLC, Forest River, Inc., Cargill Nutrition, Halco Plumbing & Heating, Blue-Ox Corporation, Brown & Brown Insurance, Lippert Components, Halleron Financial Group, Simmons-Rockwell Auto Group, Horizon Transport and Alleghany Mountain Resort. "We are truly humbled by the amazing support that this event has generated. We want to thank all of the golfers and all of our sponsors. Without their support, none of this would be possible." Next year's 6th annual tournament has been scheduled for Thursday, August 4th. To inquire about how to donate or sponsor, e-mail Brian Wilkins @ bwilkins@wilkinsrv.com or call (607) 776-3103. Congratulations to Jeff Delia, from McGraw, NY – pictured here with Jeff Lemen, Sales Representative Bath Location. Congratulations to Kelly DeYager from Churchville, NY winner of $1,000 Cash Giveaway at our Churchville location. Fairfax, VA – The Recreation Vehicle Service Technician Certification Board is pleased to announce that David McKie, Justin Stoddard, Jerry Ross, Jason Menke and James Mitchell have all successfully qualified as Certified RV Technicians. The industry certification lets consumers know that the service technician working on their RV has developed well-rounded RV repair, diagnostic, and component part replacement skills. Each technician must complete the Certification Career ladder, a comprehensive three-step testing process. Certification standards were developed by a team of RV industry technical experts under the supervision of educational testing professionals from the Michigan-based National Occupational Competency Testing Institute (NOCTI). To retain certification additional education and training requirements must be met every five years. Wilkins RV is excited to announce that Chris Hajaj of Heartland RV has been selected by our sales team as the winner of our Manufacturers Sales Rep of the Year Award for 2014. Chris is our sales rep for the Trail Runner Travel Trailer & Fairfield Park Trailer brands and has been since 2013. Chris was cited for his product knowledge, always being available to assist a sales person when needed and for doing a great job with product training on a product that has been very important to our dealerships success. At the recent Louisville trade show, Chris was presented with an award honoring his achievement and a $150 gift certificate at a local restaurant. We want to say THANK YOU to Chris for his extra effort. 2014 Best of Central Steuben readers' poll sponsored by Star Gazette media after hundreds upon hundreds of individual submissions from readers. 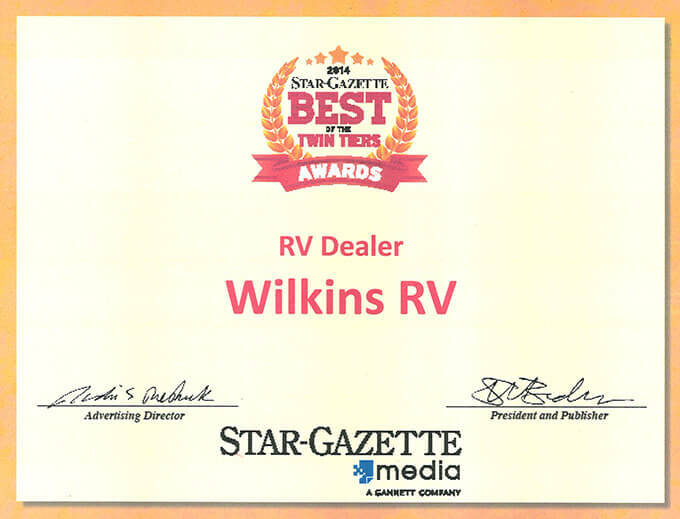 Wilkins RV was voted #1 in Best RV Dealer! Congratulations to Christine Langford from Ohio! Today, the Priority RV Network announced the winner of the Priority RV Network Travel Trailer Giveaway. The lucky winner is Christine Langford from Cincinnati, OH. Her name was chosen from thousands of entries that were entered by consumers during May 1, 2013 and February 28, 2014. The Spirit of Partnership Award recognizes an individual, business, agency, or organization who has contributed exceptional partnership services with Cornell Cooperative Extension of Steuben County in the previous year. Nominations are submitted by an individual familiar with the candidate's performance and must describe the outstanding leadership qualities of the candidate and how recipients of his or her service have benefited. Pictured left to right Brian Wilkins, President & Owner of Wilkins RV and Thomas Tomsa, Jr. Executive Director of CCE of Steuben County. In Appreciation For Outstanding Sales & Service to Customers. I am excited to announce that Paul Genovese of Forest River RV, Inc. has been selected by our sales team as the winner of our Manufacturers Sales Rep of the Year Award for 2013. Paul is our sales rep for Sun Seeker, Lexington & Solera Class C motor-homes and has been since we took on the brand in 2010. Paul was cited for his product knowledge, always being available to assist a sales person with questions and for his long hours preparing us for and helping us with the Hershey RV show. At the recent Louisville trade show, Paul was presented with an award honoring his achievement and a $150 gift certificate at a local restaurant. We want to say THANK YOU to Paul for his extra effort. We are excited to announce that Tom McMahon of Forest River RV, Inc. has been selected by our sales team as the winner of our Manufacturers Sales Rep of the Year Award for 2012. Tom is our sales rep for Flagstaff Travel Trailers, Fifth Wheels and Fold Downs and has been since we took on the brand in 2008. Tom was citing for his knowledge of his product and always being available to assist a sales person with questions or to work directly with a retail customer. It is an honor to show Tom our thanks as Wilkins RV has a long history of working with Tom. Tom was also our Palomino rep back in the late nineties. At the recent Louisville trade show, Tom was presented with an award honoring his achievement and a $150 gift certificate at a local restaurant. We want to say THANK YOU to Tom for his extra effort. We can all certainly agree that having a strong sales rep goes a long ways in helping us to successfully represent a manufacturer's product. 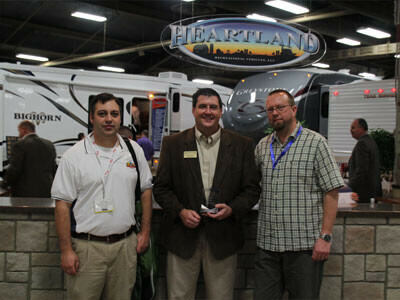 We are excited to announce that Mike Tribble of Heartland RV, LLC. has been selected for a second year in a row by our sales team as the winner of our Manufacturers Sales Rep of the Year Award for 2011. Mike is our sales rep for the Big Horn product line for Heartland RV, LLC. At the recent Louisville trade show, Mike was presented with an award honoring his achievement and a $150 gift certificate to an Elkhart area restaurant. 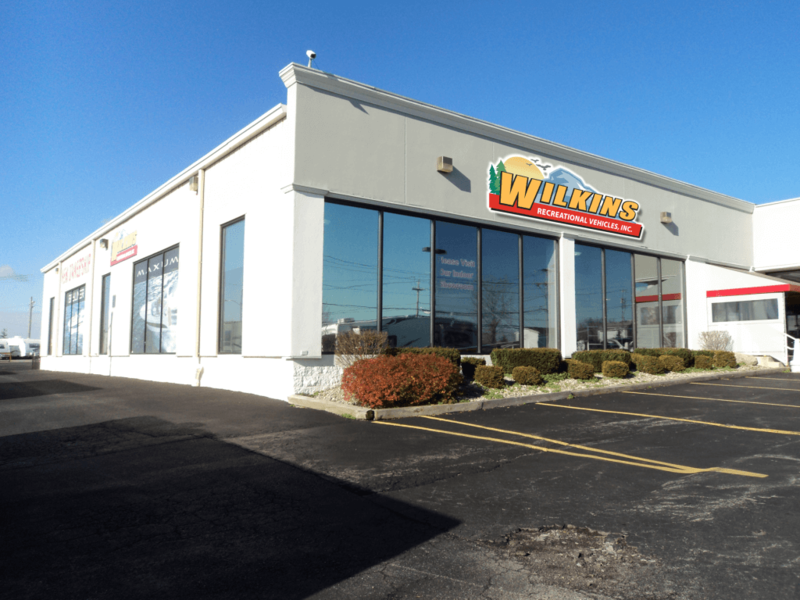 Wilkins RV Opens Second Location in Rochester, N.Y.
Wilkins RV is currently celebrating the grand opening of its new dealership, parts and service store in Rochester, N.Y. The location is the dealership's second in the region. It also owns a store about 60 miles south of Rochester in Bath, N.Y., which it opened in 2006. According to owner Brian Wilkins, who purchased the company from his father in 2004, business has been good for Wilkins RV and it's primed for more growth. "We're just trying to expand our market," Wilkins told RV PRO. "We've always done an OK job of pulling from Rochester. But as the towable market has increased and gotten bigger, I think it's harder for us to pull towable customers outside of that market, especially for travel trailers." The Rochester location affords Wilkins RV plenty of space for its 125 new and used RV inventory, Wilkins said. The main 22,000-square-foot facility sits on 7 acres, and includes an indoor showroom that can fit up to eight travel trailers and folding trailers, a 1,000-square-foot parts and accessories store, and a service center replete with six service bays. The Rochester location employees about 17 workers including five salesmen and three RV technicians. Two of the technicians are industry certified and one is working toward certification, Wilkins said. 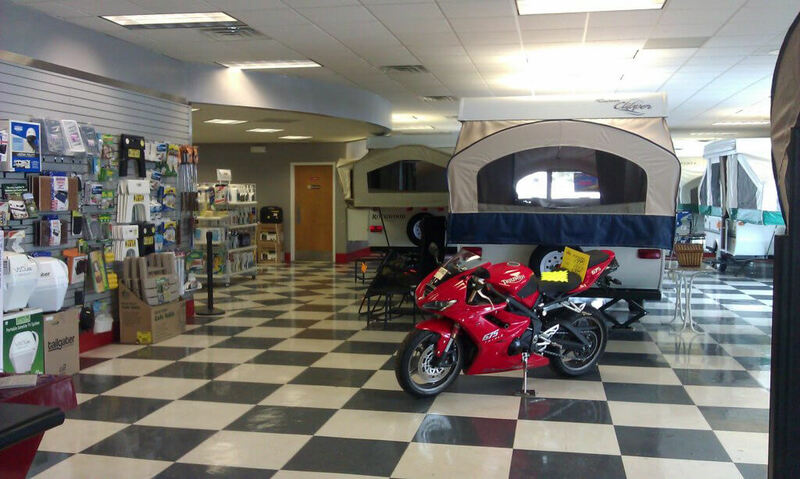 Wilkins RV in Rochester, N.Y. includes an indoor showroom that can fit up to eight travel trailers. 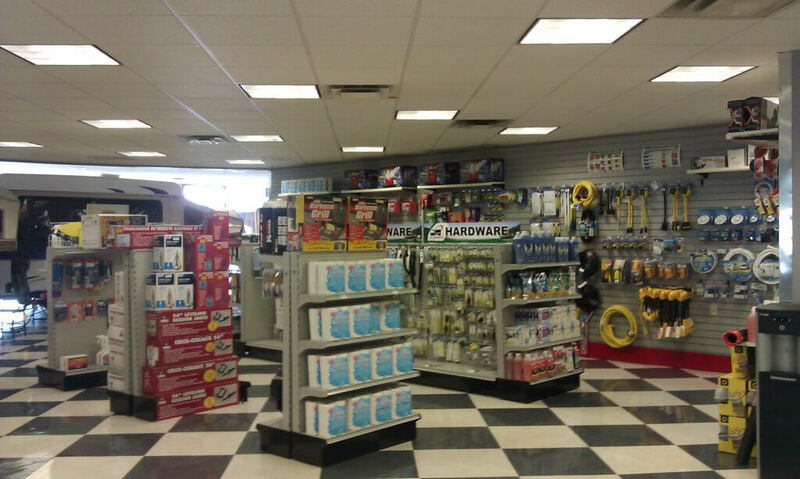 The 1,000-square-foot RV parts and accessories store conjoins with the showroom. "We're looking to add at least one more technician and possibly two," he said. "We'd like to add one (technician) as soon as possible. The second one is not quite as urgent." Before deciding to expand, Wilkins wanted to find the perfect location. He said he's found it with the Rochester facility. "The store is about 15 miles west of downtown Rochester right at Exit 3 on Interstate 490," Wilkins said. "It's a great location - real easy to get to. I don't know if I would have bought the store if it were right there off the interstate." 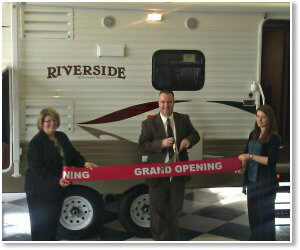 The Wilkins RV grand opening sale began Friday (March 9) and goes until Monday (March 19). The dealer currently carries Coachmen travel trailers and folding trailers, Forest River Sunseeker Class C motorhomes, Class A motorhomes by Forest River's Georgetown, travel trailers by Riverside Travel Trailer, and Koala travel trailers by Skyline RVs. Denise Haggerty is the general manager of the Wilkins RV Rochester store. "It's a pretty good market in Rochester," Wilkins said. "There are some good dealers up there." Wilkins RV just opened its second New York dealership location in Rochester. on Interstate 490. Wilkins RV in Rochester, N.Y.